In case you didn't see our previous coverage, the upcoming Blu Ray and DVD re-releases of Avatar will feature an extended cut of the film as well as a ton (they actually weighed it! Maybe.) of special features! The new edition of the groundbreaking movie will arrive in retail stores on the sixteenth of November at the price of $54.99 for the Blu Ray and $34.98 for the DVD. 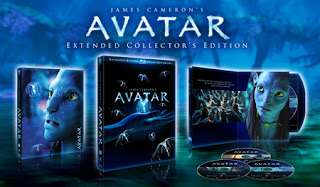 Now on to more recent events, director James Cameron and producer Jon Landau had a 'media day' where they showcased the soon to be released discs and told all in attendance about their plans for world conquest the new features. They would appreciate it if you looked on approvingly.